An efficient, economical and powerful pass through machine suitable for any busy independant kitchen. adaptable for either straight through or corner operations ensuring it will meet all your operational requirements. The hood mounted electronic soft touch control panel offers a host of additional features and a digital read out of operating temperatures. 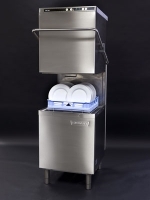 Complete with; a choice of four wash cycles 60, 120 or 180 seconds and a continuous option, items up to 420 mm tall easily accommodated, counterbalanced hood, easy strip down for quick and effective cleaning, factory fitted drain pump, energy saving standby features and supplied with a plate rack, cup rack and cutlery basket. Class A Airgrip, booster pump along with detergent and rinse aid dosing equipment. Themostop rinse control which ensures that the machine will only rinse at the correct temperature. More products in Hood / Passthrough Dishwashers.